Because of their tiny size, pet mice can live in several types of containers -- the best of which are arguably wire cages and glass-walled aquariums, as they are difficult for these crafty critters to escape from. If you keep mice in an aquarium, you have to be careful that it is the right size and shape. If it isn't, your little friends could have trouble getting the air they need to survive. Aquariums are generally measured in terms of how many gallons they hold, because they commonly house fish. You cannot choose an aquarium too large for your mouse or mice -- they'll take all the room they can get. However, an aquarium that is technically an adequate size in terms of gallons could be an unsafe home for your rodents. Tall aquariums are a poor choice, for instance, because mice can't enjoy the space -- they need room to run around, not look up at. Not only that, but air circulates poorly in a tall aquarium. A wide, shallow aquarium is best. The size of your aquarium depends entirely on how many mice you have. As you may have guessed, the more mice you own, the bigger the aquarium needs to be. You should never keep a mouse in an aquarium smaller than 10 gallons, but a 10-gallon aquarium can house up to three or four mice. Ideally, you would keep four or five mice in a 15-gallon aquarium, and you would use a 20-gallon aquarium for a group of five or six mice. Aquariums are a good choice for your mouse housing because they are secure -- there are no wires or soft walls to chew on or slip through, and access from the outside is comparably limited. You don't have bars in the way when you want to look at your little buddies, and its walls keep bedding from spilling onto your floor. The biggest concern is ventilation, which is why your aquarium shouldn't be more than 10 inches tall. A taller one doesn't necessarily get adequate oxygen to your pet. Your mouse needs some necessities and creature comforts inside his aquarium. The aquarium needs a few inches of bedding. Because there is no risk of bedding spilling out through the walls, you can give him plenty to encourage burrowing. He also needs toys and environmental distractions like furniture to keep him mentally and physically active. 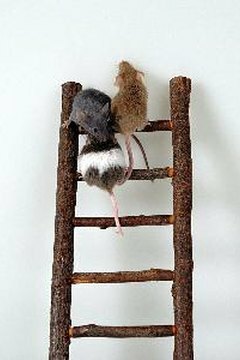 A wheel for running on is a popular choice with mice, as are PVC pipes, tiny ladders, branches and boxes.